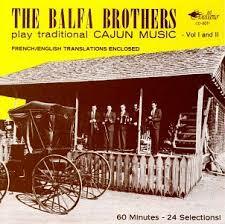 It took me a long time to come to the Balfa Brothers and it was a winding road. A lot of reasons stood in my way, but they kept falling by the wayside as other artists knocked down one roadblock after another. Of course, it all started with the radio. The stations in the Midwest, like everywhere else, played pretty much everything from Motown to Led Zeppelin, sometime one after the other, so that seemed normal. I could tell that Doctor John sounded different, but it was not so different until you heard his other stuff. Mind you, this was long before I tasted gumbo or catfish or a po’boy. I had little idea that some of those oldies that were occasionally played originated in New Orleans. Who knew that three saxophones was innovative ever? Fats Domino was cool because he was always being referenced on Happy Days. Remember, this was before Ken Burns’ Jazz told us all that Jazz music started in New Orleans. Katrina had not happened. Mardi Gras was Louisiana. Abbott & Costello never made it to Mars, but landed in New Orleans during the festival and thought they had. College students went to Florida for spring break and post-college went to Mardi Gras. Then, there was Anne Rice, so naturally New Orleans was Gothic. They had cool funerals with parades that made logical sense. They couldn’t bury people below ground, so they had crypts. Hmm, so they are living below sea level? Have to keep an eye on that. that music at the funerals sounds cool. Aaron Neville has an amazing voice. The Neville Brothers seem kind of amazing. Hold the fort- what is this other thing people are talking about? Zydeco? Cool word. Buckwheat Zydeco? Oh, man- that is the thing- that is really it. I mean- doesn’t that seem to make sense of Doctor John and Little Richard and the Nevilles and everybody else? Of course, this whole French thing… Oh, the people who settled Louisiana left Quebec and went down the Mississippi? Yes, that makes sense. It’s cold up there. They brought their music and mixed it with the Caribbean and African music coming into the city with the slave trade? Well, crap. And that is the thing with enjoying art. A lot of great self-expression comes out of pain. Our humanity today is built on the struggles of those who came before us. We need to walk the paths of history just to know that Katy Perry and Taylor Swift and The Roots and all the rest are built on a century of mastery over current circumstances. With all its songs of the world left behind, Cajun music sits next to Zydeco. Beausoleil, modern masters, toured heavily about the time that I first heard Buckwheat Zydeco and pointed the way to a strangely similar music driven by the violin. I heard one of my all time favorite songs and I wanted in. You’ve Got to Check This Out is a blog series about music, words, and all sorts of artistic matters. It started with an explanation. 194 more to go.